A more efficient, cost-effective and safe inspection process that gives better, closer monitoring and control, while you continue your business operations as usual. Industrial inspections, routine or otherwise, mostly involve the use of ladders, ropes and rigs to scale large machinery and towers, oversee processes and locate bottlenecks. As well as being risky for inspectors, the process requires machinery to be shut down, resulting in significant financial implications. 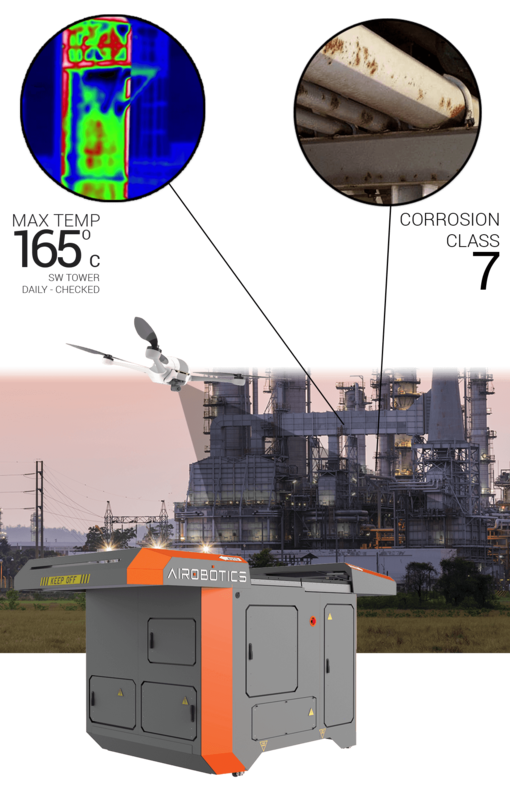 Airobotics' dynamic drone solution offers inspectors a professional tool for viewing difficult-to-access areas, giving them a safer, more cost-efficient way of gaining greater insight into operation-critical processes. By creating a completely automatic platform the drone is autonomously deployed and landed, with pre-defined missions and applications, to collect aerial data which the system analyzes, providing a clear picture of difficult-to-access machinery. The Airobotics solution is eliminating the logistics involved in drone operations to provide reliable, on-demand aerial data, premium processing and analytics capabilities, while simplifying inspection processes and enabling work to be carried out as required. Automated Gas Inspection can be a significant safety addition to Industrial Facilities such as: chemical plants, refineries and manufacturing sites. To find out how the Airobotics platform can assist you in carrying out inspections, download the complete brochure below. To date, industrial inspections have involved the use of ladders, ropes and rigs to scale large machinery and towers, oversee processes and locate bottlenecks. These processes pose grave risk to inspectors, require shutting down machinery - and may result in significant financial implications. By creating a completely automatic platform, Airobotics eliminates the logistics of drone operations, providing on-demand aerial data and premium processing and analytics capabilities. How can Airobotics help inspectors with critical and on-going inspections?